Lessons From Children – Slow Down | Live. Learn. Love. Eat. At first Kesa was doing great at keeping up with the rest of us, but at about 10 minutes into the walk she started to lag more and more behind. This was so frustrating for me because when I go for a walk, I like to walk with purpose and get some real exercise. It is a way for me to relieve some stress and come back home feeling refreshed. I kept on telling her “Come on little lamby” (that is what she likes to be called when she wears her lamb hat) and nicely asking her to hurry up, even making the walk into a game, but still she took her time in her own little world. After a while of doing this I had to ask myself, what am I in such a hurry for anyway? Here my daughter is completely in the moment enjoying her surroundings and having so much fun doing so, while I am in such a hurry to just get the walk over with. 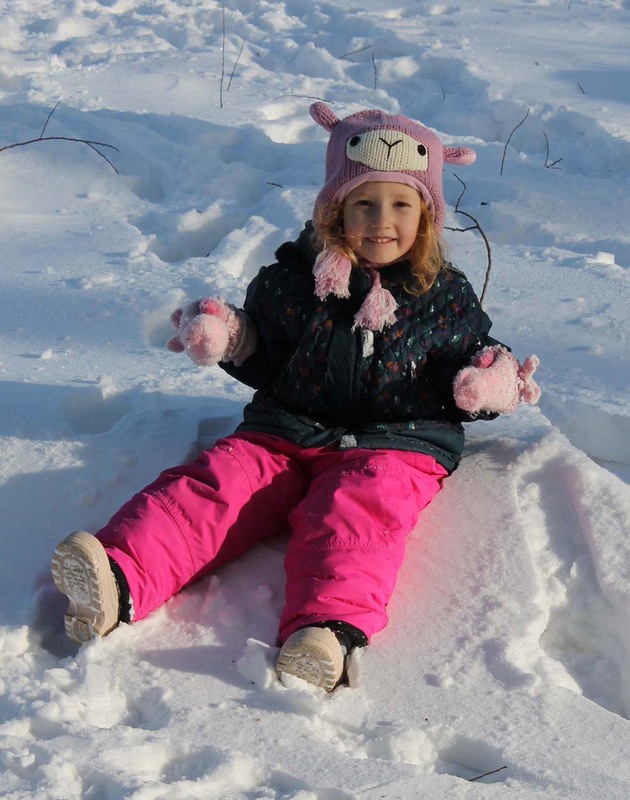 She was picking up chunks of snow and breaking them up with her hands to make a snow trail and climbing up on the snowbanks pretending to be a lamb climbing the mountain. I really had to ask myself what my hurry was. The sun was shining so bright in the sky, it was beautifully warm out and all of my kids were just so content to be there and notice all the nature around them, while my mind was already ahead of myself and thinking of what I was going to do when I got home. Being so entangled in my thoughts, I was completely missing out on it all, the sun, the snow and the precious moments with my kids! I think it is so funny how we do this. We are often in such a hurry that even while we are in the midst of doing something (something that we even want to be doing), we are planning what we are going to do next. For example, we may be having breakfast all the while thinking of what we are going to have for lunch and then completely miss out on the experience of what we are eating! I know that this is something that I am regularly guilty of, and I think we are all to a greater or lesser extent. This experience with Kesa this evening just made me aware of it again and realize how even with all of my mindfulness practice I still can learn so much more. I am grateful for the lessons that I learn from my children. There is so much we can learn from them if we take the time to really imagine life the way they see it and feel it, or to remember how we used to see the world when we were children ourselves. To a child, there is no time. There is no need to hurry or to worry about later. There is no better place to be than exactly where they are because where they are is all that they know. Telling a child to hurry up because there is somewhere else that they need to be really just makes no sense at all to them. I think it is we adults who in a way take that innocent mindfulness away from them too early. This really made me mindful of what I have lost and what I hope my children can retain for as long as they can. I had to come in and write this down so that I can remember to be like a child and just slow down. This is my number one piece of advice for new parents…slow down and enjoy the world through your child’s eyes. It is pretty magical. I learned long ago if I need a walk to get my heart rate up or to relieve some stress I make plans to go alone 🙂 Although I have to admit that on some of my more stressful days a long, slow walk taking in the world around me with Reece is just what I need. Very true! I am always planning stuff to do next. Many times while my sons were little I found myself in the same place…rushing and hurrying to get who knows where…then I would realize how I was ruining the time with the boys and how I needed to slow down and be in the moment. At one point I even stopped taking pics and video so I could enjoy the time while I was in it. Now that I have teenagers and I am not homeschooling them…I really treasure the pic and videos and memories from when they were little ones. Oh yes…great words. They teach us so much about life, those little ones!